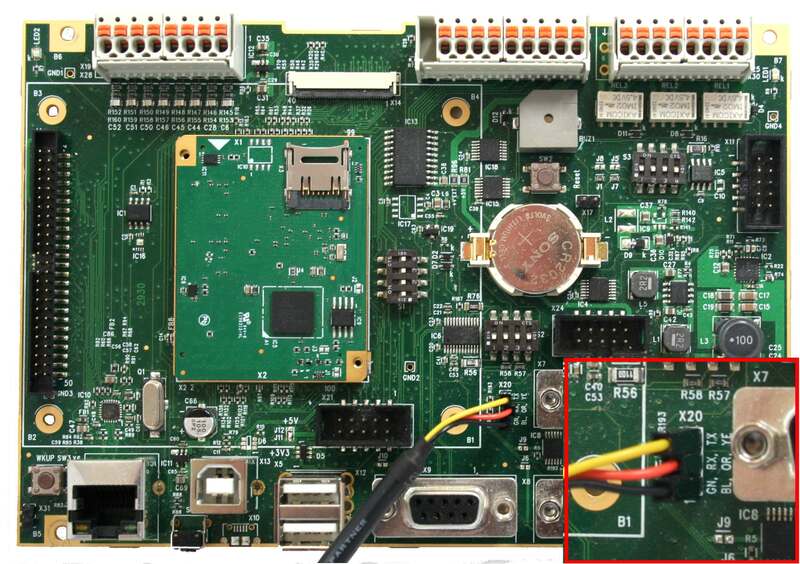 Before powering up the board, you should connect the USB FTDI cable to the debug interface (for details see Section 1, “The Debug Interface”) and the RJ45 ethernet interface to your development computer or a network switch. After that, connect the power supply to the device. In case of the PanelA5, connect the 24V power supply to connector X3. Make sure the polarity is correct. In case of the PortuxA5, connect the micro USB power supply to the micro USB port. It is recommended to setup the connection to the serial debug interface (DBGU). 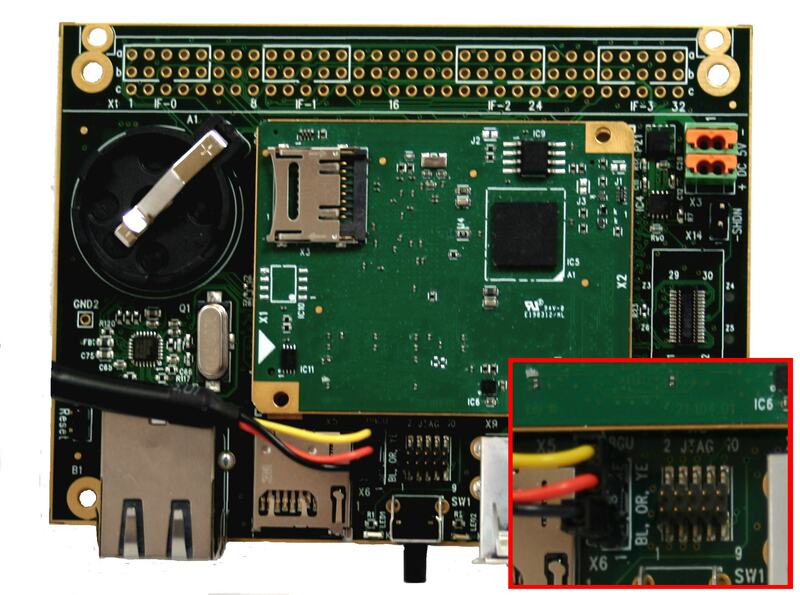 Use the supplied FTDI USB cable to connect both the PC and the DBGU interface of your board. On PanelA5, this is connector X20, on PortuxA5 it is X6. The pins are marked BL (black), OR (orange) and YE (yellow). Connect the color coded pins of the FTDI cable to the corresponding pins of the DBGU interface. See Figure 1.1, “PortuxA5 DBGU Connection” and Figure 1.2, “PanelA5 DBGU Connection” for reference. On the development host, the FTDI cable should normally be recognized as device /dev/ttyUSB0. The number can be different depending on how many USB serial converters are currently in use on the host. It will most probably ask for your password to continue. Again, you might be asked to provide your password. For this change to be effective, you have to logout and relogin again. Picocom should now start without problems. If you had already plugged in the power supply, you can now press the enter key in the terminal, where you started picocom, and a login prompt should become visible. You can now login with username root. No password will be needed. You should now be on the command prompt.